These fixtures are a big step forward compared to the city's thinking only a decade ago. I hope we continue that trend by embracing the advances in the technology that make the warmer-colored, more inviting LEDs more practical and attractive. Automatic dimming LED street lights are becoming a thing, and it looks like they are saving large amounts of electricity. That's power much better used in that Tesla, an actual positive thing for the environment. One could further well argue if any street lighting is needed at all given the apparent limited access nature of the road. A bit off-topic, but geeks will be geeks. 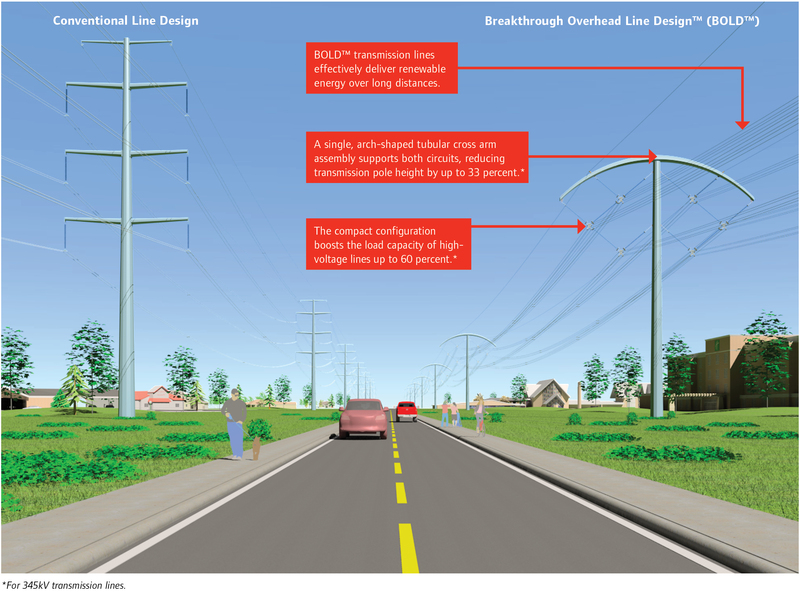 As our infrastructure continues to age, power transmission lines will start getting a new look as they are eventually replaced. Bixby is apparently in line for an upgrade to existing towers as AEP adds more capacity to accommodate circuits for the new Wind Catcher energy farm. Its touted as being safer, with less Electromagnetic radiation emanating from the bundled cables, but it appears to have turned the man on the bicycle to the right into some sort if giraffe. Some time ago I read that most of the wind farm energy was destined to be sold out of Oklahoma. If true, how does this help me? Knowing that most of that generation doesnt come from burning coal? Some good news from Seattle. SEATTLE has become one of the first major cities to announce a switch to warmer colour temperatures for its street lights. The municipality says it will replace its original 4000K LED luminaires with warmer 3000K following protests from residents..."
Except, that it will take years for the city to fully replace all of its 4000K LED installations with 3000K since they are ,presumably, only spot relamping fixtures as they burn out or fail and doing all their new projects in 3000K. I kind of liked James Benya's insight in the comments below the article. I'll say, though, I'm quite suprised of this considering how resistant Seattle, in particular, has been towards criticisms of its mistakes. Even in the article one can see how they still are dogedly making excuses. That being said, I'm quite excited in these new high efficacy warm white LEDs. Even 80 CRI 2700K now easily pushes over 100 lumens per watt, LPW, better then what even 4000K 70 CRI was doing just a few years ago. I believe the 4000K Beta LEDWay cobraheads that Los Angeles orginally used managed around 75-80 LPW. The older generation XSP performed similarly. Someone in Seattle is high. Cities all over the country have been replacing their early DOE-funded welding-torch LEDs with warmer colors; its been going on for years (and long before the AMA paper linking blue-rich light with cancers). (Since that story was published there have been numerous findings that blue-rich light stops the production of Melatonin cold, resets the "body clock" of Circadian rhythm, and most definitely disturbs sleep). As for the utility's solution, you can turn off TVs and smartphones but you cant turn off their blue light outside your window. Its good to see Seattle get it in gear, and amazing it didnt happen much earlier. They have always sold a large portion of the power they generate out of state. The nuke they wanted was gonna be about 75% out of state sales. To further add to this from Chicago..
"The conversion to LED street lamps prompted public backlash in cities like Seattle and New York, where residents complained that the first-generation of lights were too bright and bothersome. One critic in New York called them “ghoulish” and “invasive.” Some complaints were bolstered by an American Medical Association paper that warned of glare and sleep problems. 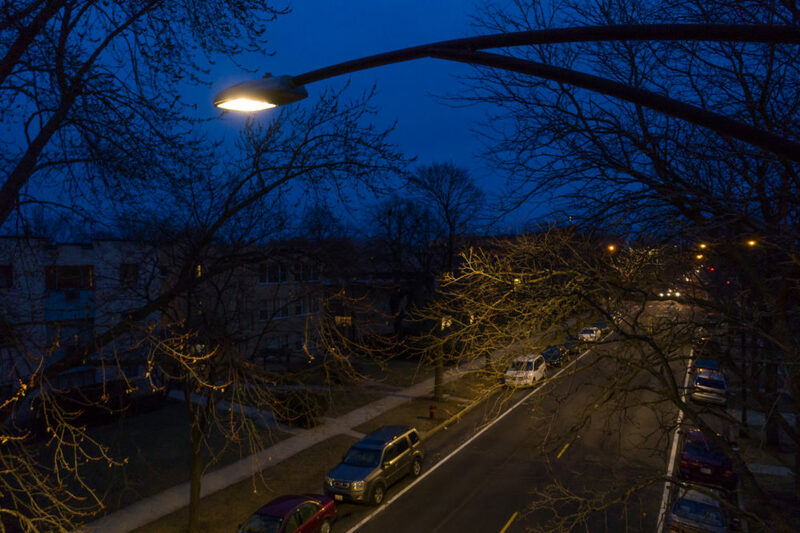 Chicago hasn’t been immune to such criticism — on a neighborhood forum, residents complained of “painful and piercing intensity light” — but it’s been relatively muted compared to the controversy in other cities. In part, at least, that’s because Chicago’s LED lamps are not as intense as those installed in other cities. Street lights are measured in kelvin, which designates the color temperature. 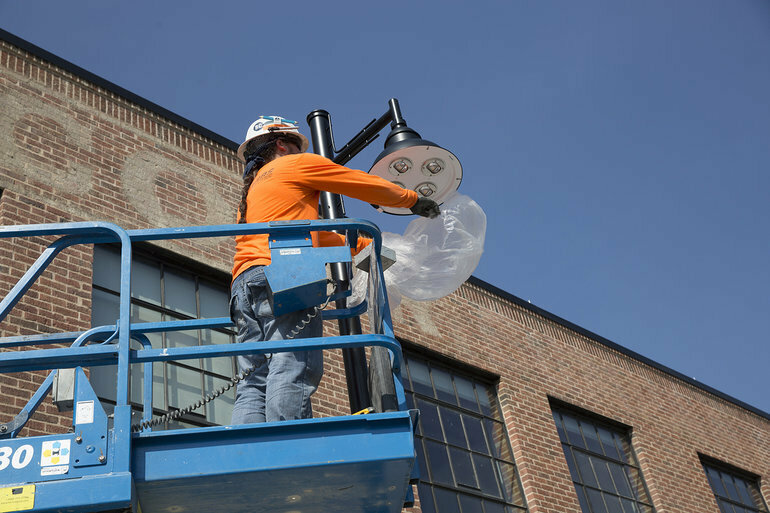 The earlier generations of LED street lamps had temperatures as high as 4,000K or 5,000K. Chicago’s will be 3,000K and able to be dimmed remotely during off-peak times, meeting two of the three AMA guidelines..."
Looks like they are using the 3000K varient of the GE Evolve for most of their cobrahead refits. Not a bad color, but I would still like to see 2700K. But to further add, it appears that Chicago is burning through it's old stockpiles of 4000K Leotek Green Cobras pushing them all into service scattered throughout the city. However, they will be replacing a mass 4000K metal halide setup they did on one of the main freeways with the 3000K's with this refit. The metal halide fixtures on Lake Shore Drive, the aforementioned freeway, aren't in too good a shape being only several years old as one would expect from metal halide. Ooop, speak of the devil, the blue-rich metal halide is going away very soon in favor of warm white 3000K LEDs. Oklahoma isn't a high-consumption state for anything. Just about everything we create in large quantities is in the majority sold out of state. Think wheat, etc... OK could use a lot more industries where we sell primarily to other states, as that would help the tax base and in general bring more money into the state, rather than buying stuff from others. Sorry! I forgot to answer the most important part - your question! It helps you by distributing the capital costs over a wider customer base, generating operating profits, and creating the associated jobs that go with that. Lets us get the benefit of 'leverage' of the investment - we get to have the price/infrastructure of say 100 units of some business activity, when we only have to buy 30 or 40. Similar to the argument the state uses related to turnpikes to rationalize that 'someone else' pays for the roads, but in this case it isn't a lie. Thought about keeping this thread alive. Here's some more of the 40 CRI+ PC Amber LED street lights, this time closer to home in Canada. "Color similarity between PC Amber and HPS allows for a one-by-one replacement." Here a PC Amber LED amongst HPS. I have some PC Amber LEDs for testing, and they do render all colors but the blues. They look like a yellow biased HPS, closer to the xenon based HPS lamp.